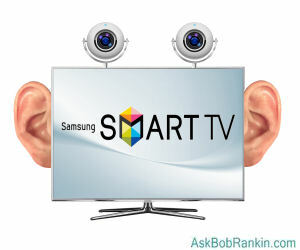 Is your Smart TV listening to everything you say in the living room? Is Apple secretly working on a driverless car to challenge Google? And what the heck is that robot doing on the beach? Get answers to these burning questions, and the scoop on the latest tech news, in this edition of the Geekly Update. It's guaranteed to make you 146% smarter. Read, think and comment! Have you always wanted to have night vision? Wish granted, just attach the $250 Seek Thermal infrared camera to your smartphone. Even your luggage is online, now. BlueSmart Connected Luggage has GPS, can charge your phone, can be remotely locked, and will text you when your bag is coming down the carousel. America’s favorite retailer is Amazon.com, according to PwC’s annual Global Consumer Survey. Fifty-two percent of U. S. respondents chose Amazon as their favorite retailer; Walmart was second with 41%. Once-dominant eBay got only 13% of votes, beating Best Buy, Kohl’s, Macy’s, Costco, JC Penney, and Home Depot. Samsung is investigating why some of the apps bundled with its Smart TVs are randomly inserting Pepsi ads in the playback streams of Australian customers. Perhaps they should start by asking the Accounting Department if they got any big checks from Pepsi recently. A robot named “Dr. ReCare” scours beaches for bits of plastic trash, melts them down, and uses the plastic to create 3D-printed recyclable trash bins, which it then places in high-traffic areas of the beach. Facebook now lets members appoint a legacy contact who can make limited changes to their pages after members die. To appoint a legacy contact, on Facebook click the Settings gear icon, then Security, and choose “Legacy Contact.” Begs the question... how does Facebook know you're dead? Toy-maker Mattel is teaming up with Google to revive the 85 year-old View Master stereoscope using technology from Google’s tongue-in-cheek virtual reality visor, Google Cardboard. The new View Master will display images from an Android smartphone’s screen or a traditional circular reel. Rumor has is that Apple has “several hundred” employees working on a driverless car to rival Google’s, and mini-vans equipped suspiciously like Google Street View cars have been spotted near Cupertino. The new Phorm case for iPad Mini tablets generates physical keys on the screen by routing liquid through invisible channels in the screen overlay, raising portions of the overlay to form pressable bumps. Most recent comments on "Geekly Update - 18 February 2015"
I ordered a new TV from Amazon for my husband's birthday. It did not ship as planned. I inquired by email, and it shipped immediately thereafter--on Sunday, for what had been a guaranteed Monday delivery. The reply email from customer service made an excuse about stock issues to explain the delay, but I also received a $50 goodwill refund. I thanked the rep and noted that every company, even Amazon, is entitled to a blip now and then. UPS scheduled the TV for delivery on Tuesday. Shortly after I received the shipping notification, however, the delivery date changed to Monday. Amazon Customer Service had contacted UPS and arranged for delivery escalation. So the TV came on time, and it cost me $50 less than the posted price. Amazon's response was overkill, but I'm grateful that Amazon is willing to go the extra mile for its customers. I buy from Amazon in preference to all other retailers, online and off. No one offers the level of service I receive from it.